MONTREAL (November 26, 2014) – It is with deep regret that the Montreal Canadiens organization learned of the passing of Mr. Gilles Tremblay, who died peacefully in Montreal in the early hours of November 26. The former player and long-time broadcaster was 75. The Montmorency native, just outside the provincial capital, was a fine two-way player throughout his career with the Montreal Canadiens in the 1960s. 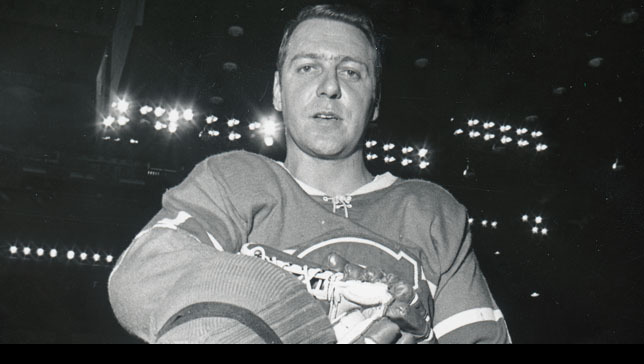 After spending four seasons in the Canadiens’ farm system, with the Hull-Ottawa Canadiens, where he played in the Memorial Cup tournament, Gilles Tremblay earned a spot on the Canadiens roster. At 22, playing his first season with the parent club in Montreal, he recorded seven goals in 45 games. He got to play his first NHL game at the Forum on November 12, 1960, in a match-up against the Detroit Red Wings. He started on a line with Bernard Geoffrion and Jean Béliveau, assigned the job of checking none other than the legendary Gordie Howe. In just his second season with the Canadiens, in 1961-62, he tallied 32 goals, just one shy of team leader Claude Provost. Known for his checking skills and his scoring touch, Gilles Tremblay reached the 20-goal plateau five times in his shortened hockey career. Tremblay, who perfected the art of successfully silencing opposing star players, helped the Canadiens earn their 13th Stanley Cup in 1965. In his nine seasons with the Canadiens, he etched his name four times on the Holy Grail. Various injuries and asthma causing serious breathing problems forced Gilles Tremblay to retire at age 33. In 509 regular season games, he scored 168 goals and 162 helpers. In Stanley Cup playoffs he added 23 points, including nine goals, in 48 games. But Gilles Tremblay would remain close to the game he loved, working as a colour analyst for the French television broadcasts of Canadiens games on La Soirée du hockey, alongside the legendary René Lecavalier and Richard Garneau. His excellent work in this field was recognized in 2002 with the Foster Hewitt Memorial Award and his induction to the Hockey Hall of Fame in the broadcasters section.